All six Foothill League track and field teams were on hand at the California Winter Track and Field State Championships at Arcadia High School this past Saturday. A multitude of Foothill League athletes participated in 17 different boys and girls events, with several coming away with top results, including two first-place finishes for Valencia and West Ranch. Vikings senior Kai Wingo finished in first in the boys 600-meter with a time of 1 minute,19.80 seconds. West Ranch junior Solomon Strader came in second with a time of 1 minute, 20.98 seconds. Golden Valley sophomore Antonio Abrego came in third at 1 minute, 21.05 seconds and West Ranch sophomore Harold Santana finished in the No. 27 spot at 1 minute, 26.05 seconds. “Last year at the finish he gave out and I told him, ‘You cannot do that this year because you could have won it last year,’” Valencia sprints and relay coach James Berkley said of Wingo. “It meant so much to him. He said, ‘Coach, I’m a senior and I want you to be proud of me. I know I let you guys down last year and I just want to win this for us.’ He ran so fast at that finish, ran so hard at that finish and we won. The Valencia team of Wingo, junior Tylyn Cook, junior Joel Isidro and senior Zaphyr Smalls finished first in the sprint medley relay (100-100-200-400-meter) with a time of 1 minute, 33.57 seconds. Cook also came in fourth place in the boys 60-meter dash with a time of 7 seconds, falling by hundredths of a second, though Berkley said that result could change soon. For West Ranch, the Championships served more as a test to see where its athletes were at physically heading into the season, head coach Sara Soltani said. The Wildcats didn’t even bring their whole team, but still finished with top results in several events. West Ranch senior Evan Bates took home the top prize in the boys 1500-meter, finishing with a time of 3 minutes, 59.82 seconds. Two other Wildcats placed with senior Alexis Romero finishing in the No. 6 spot with a time of 4 minutes, 3.85 seconds and junior Hunter Romine finished 34th with a time of 4 minutes, 14.90 seconds. Wildcats senior Natalie Ramirez came in first place in the girls shot put (4kgs) with a 47-foot throw, the best of her career. Wildcats senior Shelbi Schauble finished second in the girls triple jump with a score of 38-1 and senior Amber Racina finished in fifth place in the girls pole vault with a 11-4 result. In addition to Ramirez winning the shot put event, she came in fourth place in the girls weight throw (20lbs) with a score of 43-11 ¾. Her teammate sophomore Erynn Pasamba finished tenth with a score of 32-2. The West Ranch senior duo of Peyton Washington and London Lewis finished in ninth (1 minute, 39.28 seconds) and 12th (1 minute, 40.03 seconds) respectively in the girls 600-meter. “On the boys side we’re coming off a very good cross-country season. We finished second overall in the state, we finished eighth at nationals and that success has trickled into track and field,” Soltani said. “Our vision is CIF and state. Can we hit the podium as a team having a great sprinter in Solomon Strader, and now having four or five great distance boys who have the potential to make it to CIF and state as well. The handful of top finishes earned the West Ranch girls and boys teams a second place result in the team scores. Valencia finished in fourth place as a team in the boys division. Golden Valley was also well-represented with several top-15 finishes including Abrego’s third-place finish in the boys 600-meter. Grizzlies senior Angelena Williams finished eighth in the girls 60-meter hurdles with a time of 9.36 seconds. Golden Valley freshman Tylar Gallien finished eighth in the girls 300-meter with a time of 41.04 seconds and her teammate sophomore Yleana Lopez finished at No. 13 with a time of 41.54 seconds. Lopez also recorded a time of 8 seconds in the girls 60-meter dash, good for the No. 14 spot. Sophomore Kienan Donovan finished fourth in the boys shot put (12lbs) for the Grizzlies with a throw of 54-9 ½. Canyon senior Jacob Lopez finished third in the same event with a throw of 55-6. Aside from Lopez, Canyon had one other top-three finisher, with junior Tyler Cash finishing second in the boys high jump with a score of 6-5. The Cowboys also finished 15th in the girls sprint medley relay with a time of 1 minute, 59.06 seconds. Junior Lauren Onestinghel, senior Kamrin Coleman, senior Denie Stark and sophomore Ryann Blumel comprised the team. Canyon’s boys sprint medley relay team finished at No. 16 with a time of 1 minute, 41.84 seconds. The team consisted of sophomore Nolan Men, junior Justin Bradford, junior Matthew Elizondo and senior Gavin Fielder. 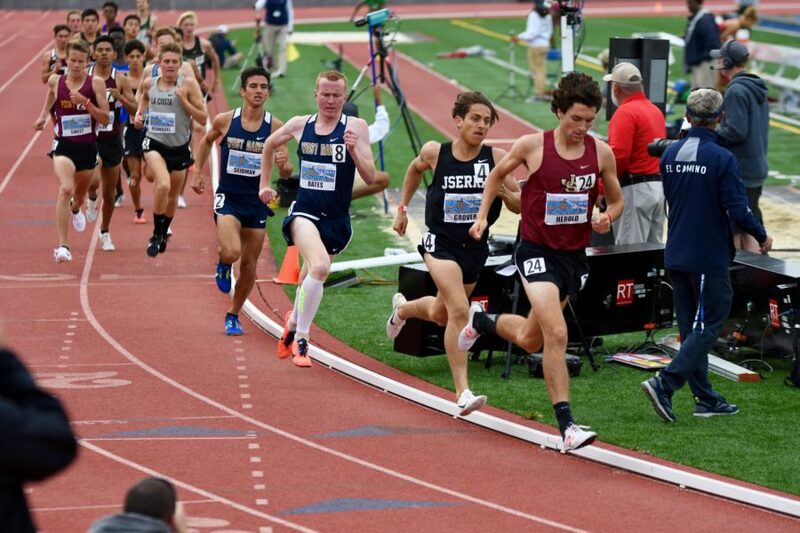 Saugus had two runners finish in the top-six in the boys 300-meter, with sophomore Zachariah Turner finishing in fourth place with a time of 35.27 seconds and sophomore Brandon Cruz finishing in sixth place with a time of 35.78 seconds. Senior Isaiah Turner finished in the No. 16 spot in the boys 60-meter dash for the Centurions after placing seventh in the prelims for the same race. Hart had one runner place in the top 10 with senior Joe Hlyton finishing seventh in the boys 60-meter dash, recording a time of 7.10 seconds. Other top-40 finishes include: Valencia senior Juliana Anuakpado finishing at No. 20 in the girls 300-meter with a time of 42.17, West Ranch junior Jenneh Sesay finishing at No. 33 in the girls 60-meter dash prelims with a time of 8.12 seconds, West Ranch senior Michael LaQuay grabbing the No. 29 spot in the boys 300-meter at 37.35 seconds and Valencia’s Smalls coming in at No. 37 in the boys 300-meter at 37.98 seconds.